BY DELIVERING A SUITE OF PRODUCTS AND SERVICES THAT IMPROVE EFFICIENCY BY REDUCING COSTS, IMPROVING OPERATIONAL capacity, IMPROVING ORGANISATIONAL CAPABILITY, AND BUILDING CUSTOMER AND EMPLOYEE LOYALTY. WE USE OUR VERY OWN PROVEN MODELS THAT DELIVER THE RESULTS OUR CLIENTS WANT. ANY ENTERPRISE, BE THEY SMALL OR LARGE, WOULD BE MEASURED AGAINST THESE PARAMETERS. When you adopt the recommendations of a BBB review, we offer our support to assist your implementation initiatives and assist you in making the changes suggested by the findings of our review. 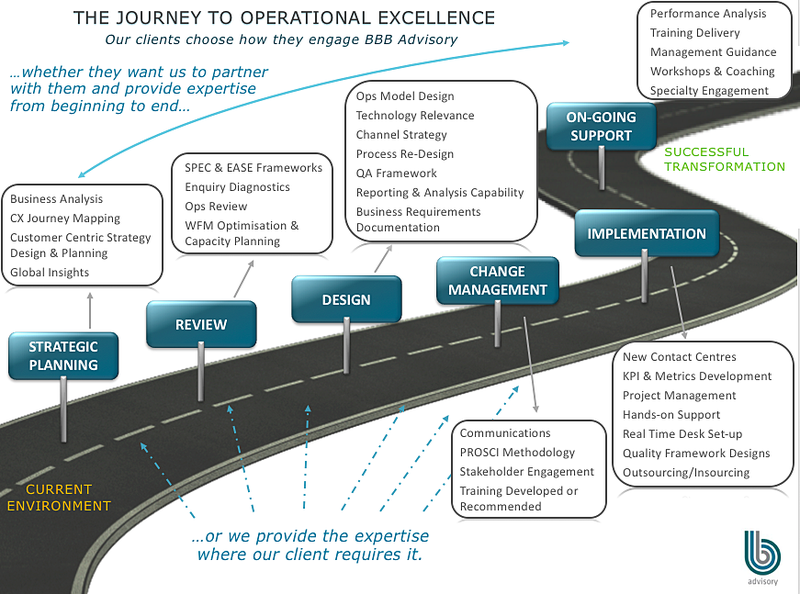 This support runs across a range of transition to transformation services, and the BBB difference is in our agility to work with you from the beginning in reviewing and recommending, to strategy and planning, to implementation, training and then ongoing support - or we can simply assist in the areas your business needs the additional expertise in. We conduct most of our work on your premises, we fit into and adapt to your culture so we can maximise your solutions and results faster. Once a BBB Advisory review has been conducted, and recommendations given, the above transition to transformation services can be scheduled into a fast track program, or planned more slowly over an extended period. The team knows our client's preparedness for change will vary from one business to another, and are open about timelines and can help you contrast this with your organisation's necessity for it's desired outcome - both approaches deliver the same outcomes but over different time frames. Curious and wanting to discuss more? Just who would you be working with?